Talking about the mid-face is a mystery to many people. The mid-face is not your jowls, which is in the lower face. The mid-face is essentially the area around your cheek bones. As we get older, it might appear that the mid-face is dropping because of gravity, and this is somewhat true. However the many causes of mid-face problems is a loss of volume, or a loss of body fat. As we age we tend to loss fat in all the wrong places. In the face, the biggest volume losses are in the mid-face and the mariet line of the chin. I have been trained in doing the traditional mid-face lift. However in my opinion a much better procedure can be done and accomplished superior results with a much less invasive procedure. Since the main problem is volume loss, a cheek bone implant is far superior a result with much less risk. I have stopped doing mid-face lifts because a superior result can be obtained that will be permanent. Please see the FACIAL IMPLANT section for a further explanation on the mid-face. There are several different types of implants that can be placed for correction of the mid-face. In order to correct these problems, an incision has to be made. 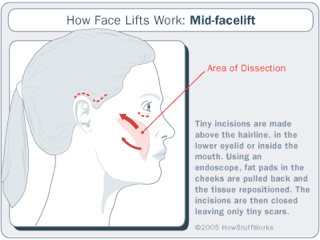 For a minor facelift, a small incision is made in front of the ear. This procedure has been made popular by many television ads. This procedure can be done in our office under local anesthesia or light sedation. More invasive facelifts can also be done on an outpatient basis and these procedures I do in conjunction with a general surgeon in his facility.